On 8th May, 21 Term 1 Pre U students a..k.a.Lower sixth formers registered officially as ASAR Pre U students. Ahlan wa sahlan and congratulations. A simple Orientation Programme was carried out from 13 to 17 May. Activities included briefings, games, social services and others. Below are the photos to document the events. Tn Hj Kanil briefing the Pre U Students. 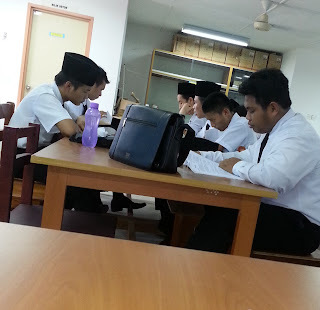 At the same time, their seniors sat for the Term 2 STPM exam from 20th to 22nd May 2013. The exam was conducted at the APD room to allow privacy and silence for the candidates. InsyaAllah, success be with you. 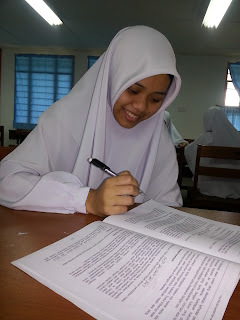 Dayang Siti, calmly revising before entering the exam room. Peace be upon all/Greetings. Dearest Pre U ASAR blog followers... Do accept my apologies as the following entry for today's post may sound a bit formal. Not in creative mode at the moment....A bit 'dizzy' after entertaining ex-fifth formers who requested for assistance in filling in the online forms to join Form 6. Below is the short report for today's post title. SMKA Igan Pre U Administrative team made a bench mark visit to ASAR. The team leader was Ustazah Noriah, the school principal and she was accompanied by 4 others, the PK1, PKT6, and 2 SMKA Igan Pre U teachers. 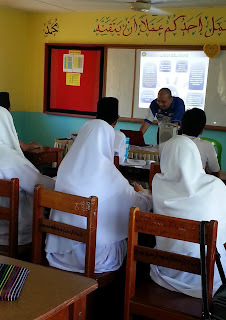 Ustaz Kanil, together with PK KK And PKHEM welcomed them at the school office and escorted the quests to Raudah al-ilmi, where the ASAR Pre U teachers stationed. After signing the guest book, there were short speeches by Ustazah Noriah and Ustaz Kanil (Ustazah Seraya had to leave early for Sibu). 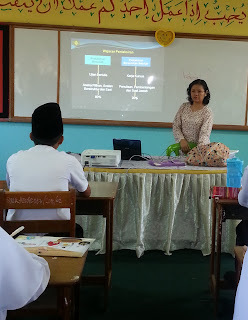 Next was the sharing session regarding the administration of ASAR Pre U by ASAR PKT6, Madam Nelley. The guests were also entertained with a short movie potraying the activities conducted or participated by ASAR Pre U students. Compliments to Iffa of Pre U Cemerlang for preparing the movie. Later the guests were served tea and coffee with very delicious fusion cuisines nyum...nyum...chocolate cup cakes, dragon fruit pudding, traditional 'kueh takir', red bean cakes and Laksa Sarawak. The team made a move back to their hotel at 5.45pm. 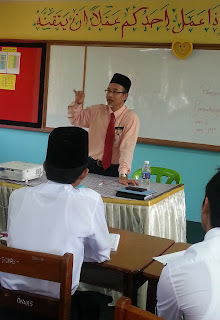 Thanks to all pre U teachers, Madam Naimah, Ustazah Nooraishah, Madam Amira, Miss Marilyn, Mr Rahim, Ustaz Norul and not forgetting, Miss Aida for your contributions, hard work, efforts, time, ideas and the list continues. May Allah bless you all. Congratulations. You are the BEST. (Only the BEST in the Pre U team, InsyaAllah) Well, that's all for the time being. Before signing off, Ahlan Wa Sahlan to all pre U students session 2013/2014. Registration on 8th May. See you all. 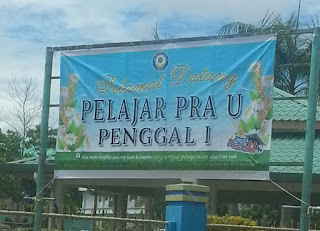 InsyaAllah.